Went out diving around Plymouth on Friday with Ricky and we had a few Bass between us, a decent Pollack of about 5lb for me and a few Mullet – we were pretty pleased with our day’s efforts. 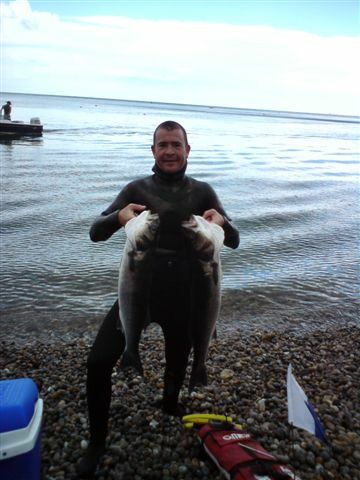 The next day I was down in East Devon with the family and fished a favourite spot which I normally only expect to find schoolies in, diving down to 5m and lying up in the kelp I had a solitary big Bass come in to me on Agachon, I stoned him with a lateral line shot in the shoulder – I knew he was a big boy but had to wait until I got out to know for sure. I carried on diving and out where the kelp and sand meet I dived again to about 6/7m and got down into the kelp, from the surface I had seen alot of small bait which looked like smelt surround me (looking like they were running from something) – this time I had 4 large fish come in and swim past in front about 2/3m away – I took one of these also. My first fish came in at 13lb 11oz the second one at 10lb 8oz. These were two PBs in one trip. I didn’t have the heart to keep fishing for these beauty’s after that – I reckon I could have taken more but I had more than enough to eat and for the freezer so called it a day.